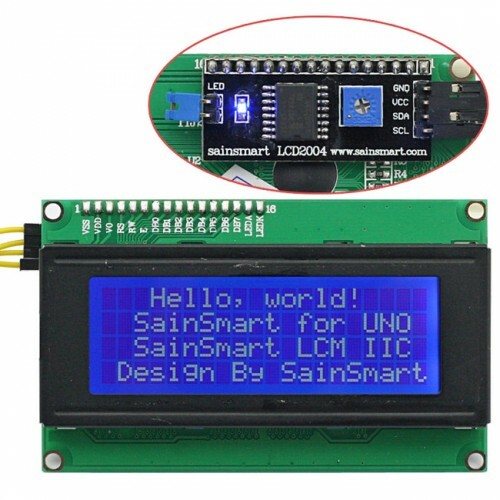 We want to use a 4×20 caracters Arduino LCD on the Raspberry Pi. We will use the I²C protocol and a small python class to access the display. As you can see in this picture, the LCD display has an included I²C board. Wiring is based on our add a RTC clock previous tutorial . The two modules (RTC and display) could be used in pair, thanks to the I²C protocol. You could even chain more I²C devices. Our precious Raspberry Pi works with a 3.3V logic. The display is a 5V logic device. When the Pi’s I²C internal pull-ups are ok for the RTC clock, those won’t be enough to handle the display. So, we’ll use a small I²C logic converter. It will be very usefull for our future projects, because it allows using 3.3V and 5V devices without worrying about I²C logic levels. A ready-to-use converter costs only a few cents, so it’s a very nice component to add to the Pi. Edit – 07-09-2015 : The github library has been updated to support backlight toggling ! With this wiring, one could add I²C devices, without worrying about logic levels : 5V modules connect to the converter’s A side, 3.3V modules connect to the B side. Easy. 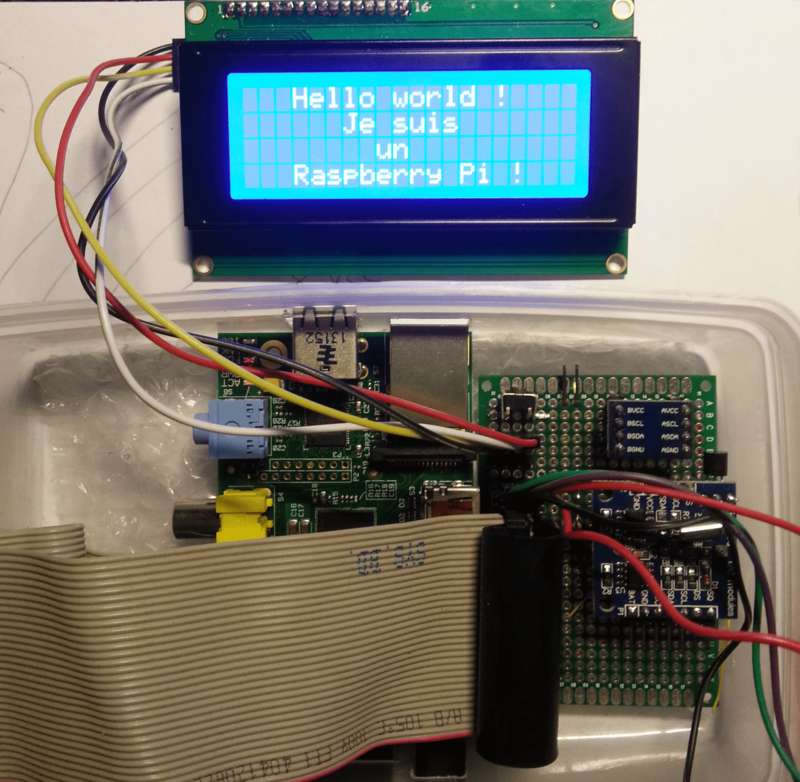 Our Raspberry should be ready to use I²C devices after a new reboot. – DS1307 RTC with address #68. It is noted « UU » because it’s in use. Your display may have another address. I’ve seen #24 and #28 but it can be something else. It should be indicated in the display’s datasheet. We need this address to setup the driver a little later. To ‘talk’ with the display, we will use a small python class. So, the prefered language to use the display will also be python. If you want to use the display in a python script, you only have to include those 2 files your script folder. As you can see, using this display with the Pi is very easy. Hi, Can you help me ? My LCD is working fine after do what you post here 😉 Awesome, i bought last week and i put it working quickly with this tutorial. Hi, almost what you want is already running on my Pi. I’ll give you the code in a few hours (have to come back home). Hi, you could find almost what you want here (you have to check the i2c adress) : https://github.com/CaptainStouf/raspberry_lcd4x20_I2C/blob/master/lcd_leds_button.py.